And powdered from head to knee. In a bespoke three-piece woolen suit. The quarrel I have with thee. To the herringbone, that’s the hitch. But nothing compared to the tartan. Is closest to executive spec. To decide in the midst of all voices. It is always intelligent to wear. For herringbone seeks to impress. In an order most categorical. And our admirers will all be delighted! Some lines and a verse full of rhyme and fashion advice is a great way to get you warmed up for what is on the horological menu today: a topic that would usually be found in GQ or as a filler piece for the more serious wrist-centric authors, how a watch pairs with your wardrobe just became a much more considered affair. This is all thanks to the Vacheron Constantin Métiers d’Art Elegance Sartoriale collection, which was unveiled on April 1, 2016 (in a twist not as one of the typical jokes of the day) during the European Artistic Crafts Days. In a clear nod to the art, skill, and craft of the sartorial profession, the Métiers d’Art Elegance Sartoriale collection seeks to embody and mimic classic patterns found in suit and shirt fabrics. Sartorial means “of or relating to a tailor and his trade,” and based on the different edition names in the collection, it should be obvious where the intent lay. The first objective of the Sartoriale collection is to highlight classic patterns, but also to provide an extension of, and connection to, the fabrics the wearer might be using. In fashion, pairing colors and patterns is what separates the amateurs from the pros. Professional designers know that only certain types of patterns work together and that pairing incongruous patterns can create an oddly dissociate visual effect. This is why sometimes things just don’t look right together. A closer look at visual perception reveals that some patterns can cause our brains to fail, giving rise to the modern “optical illusions.” Conversely, there are certain patterns that are pleasing to the eye, which have given rise to established patterns found in art, architecture, and fashion. The development of fabric patterns is the natural result. In men’s fashion, and suiting to be specific, there are many “standards” and variations of those standards. Vacheron Constantin narrowed down all the options to five representative patterns to use on the dials of each edition of the Métiers d’Art Elegance Sartoriale collection. These are the ever-popular pinstripe, the Prince of Wales check (or Glen plaid), the timeless herringbone, the bolder windowpane, and the pattern of my people, the tartan. These five represent a base for the huge amount of fabric patterns that have been created over the last few hundred years. Each pattern makes up half (if not two-thirds) of the dial with a smaller offset subdial to display the time. The patterns are truly the stars of this collection, not just because they are taken right from the folds of fashion, but because they are all incredibly difficult to engrave due to their complex designs. Every single line is engraved by hand on a rose engine lathe using a process known as guilloché. Any guilloché pattern takes a long time to set up and engrave, but these fabric patterns are uniquely complicated, especially the tartan and Glen plaid. Depending on how many different setups and pattern changes are in a design, the process of guilloché can easily take hours that turn into days. Each new line pattern requires a different machine setting, and each direction requires a new setup that needs to be aligned perfectly. And since all of the actual engraving in done by hand, any variation in the pattern needs to be planned and carefully applied. Then, after each dial is successfully engraved it is sent for enameling. Each pattern gets its own unique color to fit stylistically with the pattern. And since the patterns themselves can cause interesting light reflections, more than 30 attempts were needed to find the right hues for the high-fire enamel. At this point there is already a huge amount of work applied to the dials and we haven’t even talked about the time display, which comprises a two-part gold dial whose center has its own unique engraving. The process for this is the same one utilized on the Audemars Piguet Royal Oak tapisserie dials, which are created using a rotary, reducing pantograph – in essence, an automated ratio-shrinking rose engine lathe. Here a larger and very accurate version of the design is machined into a hard, yet low friction material (or coated with a low friction material). A tracer stylus slowly rides over the design, while a small graver rides on a thin plate of gold to cut out the design in a much smaller size. Both the original design and the new plate rotate while the stylus slowly moves outward from the center in a very tight spiral. This creates a fairly smooth yet distinctive look. The gold dial centers also are unique patterns related or matched to each primary dial pattern. For example, a floral (paisley) pattern is matched to the herringbone, while an eastern-style geometric pattern is matched to the pinstripe dial. 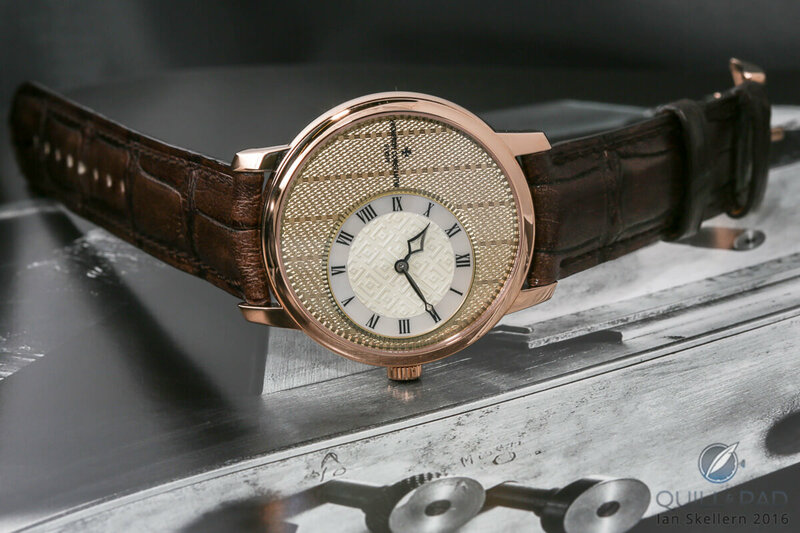 The engraving is frosted (typically a delicate flame-heating technique) to provide a feel that mimics silk, making the varied patterns feel like a pocket square in the “front pocket” of the dials. These patterns are all very interesting together and provide almost the entire visual interest for the watches. The second part of the time display dial is a ring of mother-of-pearl (which mimics buttons) that is the perfect substrate for printed Roman numerals. Aside from the ghost of a logo on the left side of the main dial, this is the only text found on the front of the watch. It is clear that these watches are meant for wearing when well dressed, and the wearer is likely to be a fan of sartorial patterns, matching suit, shirt, tie, etc. The watch dial colors can match a tie, shirt, socks, stitching detail, while patterns can match pocket square, jacket, vest, or shirt. Adding these watches to a wardrobe as part of “suiting up” is the absolute right way to utilize them. They are, first and foremost, formal watches to be worn with formal clothing. Granted, you could wear them with a polo shirt and khakis on the weekend, but they yearn to be matched to a great suit or even a tuxedo. But if this is the intended destination, a few other things must have been taken into account. The diameter of these watches is a very modest 39 mm, creating a perfect size to compliment more formal dress. Given that they need to be worn under a cuff as well, the next design decision makes a lot of sense: the movement. Utilizing manually winding (no automatic winding in a formal watch please; we aren’t heathens) Caliber 1400, the movement size helps to keep the thickness of the watch down as well. The movement itself is only 2.6 mm thick and 20 mm in diameter enabling a svelte case at only 8.2 mm thick, well in the range of an elegant under-the-cuff timepiece. In fact, since the movement is so svelte, the transparent window on the case back (which is directly opposite the time display) provides a view into the entire movement while leaving a larger amount of open space. The empty space on the case back mirrors the primary dial in size, lending the watch ample room for personal customization. It seems that everything about this collection has been considered, right down to the unique, colored straps that complement each dial. That actually isn’t something a lot of watches can boast, since there are almost always design decisions made outside of the context of intended use. All of the details in the Métiers d’Art Elegance Sartoriale collection would impress not only a gentleman, but perhaps also a dandy fully immersed in style and appearance culture. They really do call out to any sartorial nerd, and I dream of getting my hands on one (or five) to add to my collection so I can match them with all of my finest clothing. I wonder which one goes best with a t-shirt and jeans? While I sort through my closet, how about we break this collection down! Wowza Factor * 9.00 A watch that finally can truly match your suit? I’m in! Late Night Lust Appeal * 84.66 » 830.23 m/s2 The amount of wardrobe changes I would undergo after picking up one of these would keep me up till the wee hours. That is a lot of late night lusting! M.G.R. * 58.9 Hallmark of Geneva? Check! Beautifully finished movement from one of the “holy trinity”? Check! It seems to have the right pedigree for me. Added-Functionitis * N/A Again and again we have time-only watches that are awesome not for complication, but for style, presentation, or pizazz. Métiers d’Art Elegance Sartoriale collection is no exception, except you won’t be needing Gotta-HAVE-That cream as they are swelling more with beauty! Ouch Outline * 9.45 Cracking a tooth on a spoon. Sometimes I simply remember feelings and know they are spot on. This is a feeling I really, REALLY don’t want to experience again. But . . . if one of the Métiers d’Art Elegance Sartoriale collection is on the table, I think I’d do it again! Mermaid Moment * This matches perfectly with my tartan wool suit! Once you discover that, it’s only a matter of time before you realize it will also go with the tux you plan on renting for the ceremony! Awesome Total * 600 Multiply the diameter of the case (39 mm) with the power reserve in hours (40), then divide by the thickness of the movement (2.6 mm) and you have the ridiculously awesome total! 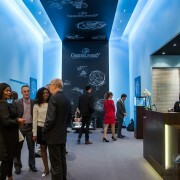 For more information, please visit www.vacheron-constantin.com/en/metiers-d-art-elegance-sartoriale-mens-watches.